On a wall at the Agriculture & Land-Based Training Association (ALBA) organic farm, Juan Carlos Gonzalez of Urban Arts Collaborative helps kids from an after-school program in East Salinas express themselves. As the late afternoon sun paints everything gold, smiling kids hold their clipboards close as they identify fragrant herbs. Notes are made, and the organic farm tour moves into green fields, bees still at work in the intensifying light. Back toward the road, children happy to work with paintbrushes eagerly create radiant red strawberries on a wall, while others, clutching bags of fresh produce, learn about what happens in a compost pile. There’s a school bus in the driveway, ready to head back to East Salinas, but no one seems to want to go just yet. The field trip is a learning experience brought about by Urban Arts Collaborative (UAC) for kids participating in the Life Is for Everyone (LIFE) after-school program. Everyone knows each other, so it’s relaxed and fun. These kids already have an interest in healthy eating, as they have worked together with UAC on a community garden right behind their classrooms in town. UAC’s approach to youth outreach is as all-encompassing and colorful as one of the edible mandalas made by Rudy Jimenez, the group’s food justice organizer. Rudy Jimenez, food justice organizer with Urban Arts Collaborative, teaches kids from the LIFE after-school program a bit about marigolds. From left, they are Noemi Lopez, Ivan Delgado, and Daphne Cuellar, in front. Looking on is Miguel Flores. It is no accident that UAC’s approach to teaching has many connecting threads. The group aims high, seeking to help develop a world where youth equity, creative expression, land stewardship, food justice, and respect for LGBT rights are all givens, part of a unifying fabric that allows everyone to move forward together. The number and variety of projects UAC has taken on reflects their commitment to community health from multiple angles. Many of these initiatives complement each other, supporting and engaging youth in different ways. For example, UAC is partnering with Rancho Cielo Youth Campus in Salinas, a program that provides education and vocational training to system-impacted youth. Thanks to UAC, the students now also benefit from drawing and art skills classes as well as an introduction to organic farming course. Gonzalez is also teaching art to formerly-incarcerated youth at Monterey County Juvenile Hall, where part of the support for their re-entry to their communities is an invitation to visit and learn about Green Thumb Organics, run by UAC’s Rudy Jimenez. 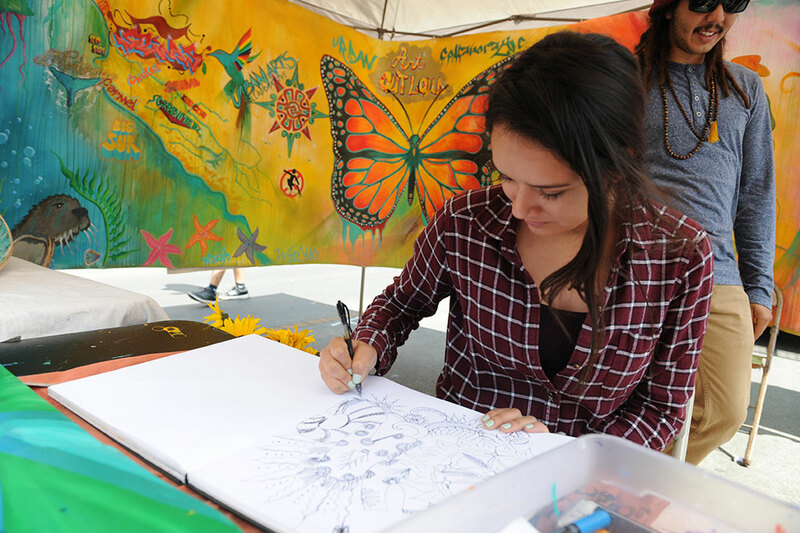 Artists Diana Renteria and Luis Rodriguez of the Urban Arts Collaborative at their booth during the 2016 Ciclovia event in East Salinas. UAC is a constant presence at community events and celebrations. Tackling community health from another angle, as part of UAC’s LGBT outreach, the group is collaborating with the Be Yourself Club at Alisal High School. The club is supervised by Alisal’s Natalie Bernasconi, who has helped them expand to other Salinas high schools. Working with The Epicenter in Salinas, the Diversity Center of Santa Cruz County, and California Rural Legal Assistance, UAC created a colorful inclusion float for the El Grito Parade, extending a hand to Spanish-speaking LGBT residents. UAC has also co-sponsored the LatinX LGBTQ Film Festival at Salinas’s Maya Cinemas, where artwork created by students will also be on display. Luis Rodriguez and Danny Montenegro of UAC have helped guide these outreach efforts. Rodriguez, 27, is the group’s project coordinator, and was doing his own organizing in Natividad Creek Park before coming aboard in 2014. His interests in art, skateboarding, and healthy eating are helping UAC engage a whole new group of youth. 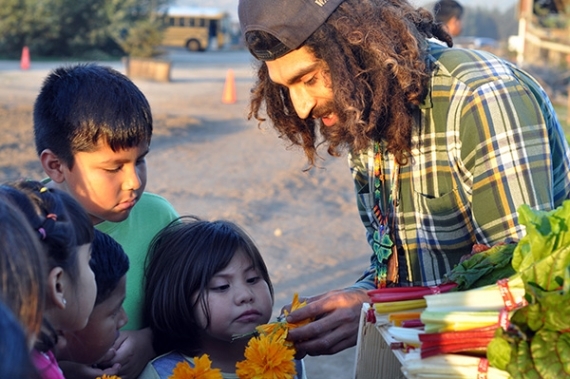 Rodriguez’s ideas are entirely in keeping with the vision of Salinas as an agricultural Mecca: a “healthy hub,” where grassroots organizations might find support, where a community kitchen and garden might offer workshops on cooking and sustainable practices, where budding entrepreneurs might test ideas. Thanks to UAC’s dedication to its vision, there is imaginative beauty gracing Main Street in Oldtown Salinas, nature-themed public art in nearby Soledad, and a new mural at the ALBA farm. 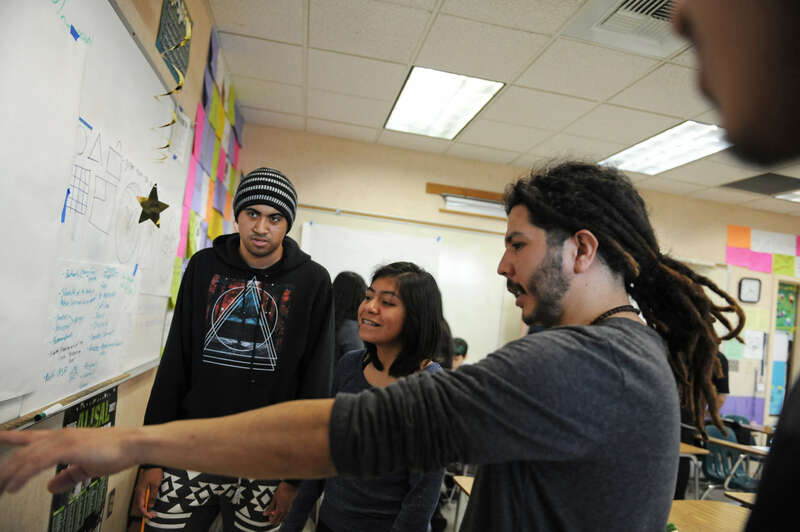 Urban Arts Collaborative’s Luis Rodriguez, right, and Danny Montenegro, not pictured, work with members of the Alisal High School Be Yourself Club on several pieces of art created for the second LatinX LGBTQ Film Festival in Salinas.